Puhua International Hospital has been at the forefront of the treatment with thousands of patients having already undergone our procedures. Before we can know how to get rid of joint pain, we need to understand what causes it. At it’s fundamental level, Arthritis is an inflammation of joints that causes stiffness and immobility. When we look deeper at the root causes of arthritis we find that much of it can be traced the degradation of the meniscus tissue in these joints. What does this mean for my treatment options? Traditionally speaking, when a joint such as a knee of hips begins to degrade, there were few options to get rid of joint pain available other than simply alleviating the symptoms. With the advent of “hammer and chisel” knee and hip replacements, human immobility due to advanced age could be greatly alleviated temporarily but at a high and irreparable cost. Knee and hips replacements are major surgeries that are generally only done once in a person’s lifetime. As one ages it becomes increasingly risky to perform major operations and as such ends to be a one off. This is a problem because with the advancements in prosthetics has not kept up with the rate of increase in human life expectancy. Most people begin experiencing joint pain in their mid 40s with some having an early onset as early as their 30s. Historically, prosthetic hips and knees last between 10 – 15 years with the most advanced possibly lasting 20. This creates a gulf in the medical need of patients as people regularly live into their 80s and beyond these days. The end result of many years of research into the extraction and applications of SVF, the world’s leading medical scientists created the SVF + PRP procedure which generates MSCs through the use of the patient’s own fat cells. Stromal Vascular Fraction (SVF) is the end product that is obtained by breaking down adipose tissue. This end product contains various cell types, including mesenchymal stem cells(MSCs). 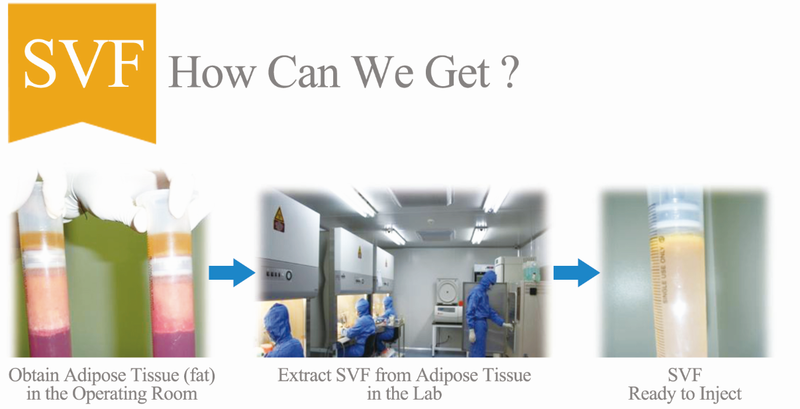 SVF obtained from 100cc adipose tissue, contains around 40million MSCs. This not only alleviates most of the controversy surround stem cell treatment but also ensures that one’s body does not reject the cells. 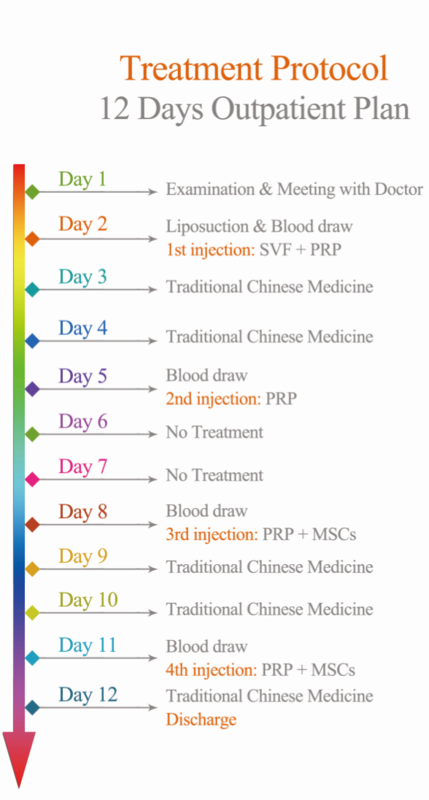 Why do we add PRP? >90% of patients saw an improvement in symptoms by the 3rd month following their treatment. 65-70% of patients described their improvement as significant or life changing. MRI findings cartilage regeneration: 80% .